Rigzin was quite slow upfront as we moved deeper and deeper into the unknown terrain. The vistas were magnificent, a bit different than what we had been seeing within Changthang for the last three days. The views were like paintings done by a world class artist using all his favourite colors 🙂 … At once, we were running close to Shyok river and soon we gained tremendous altitude. It was getting a bit scary and then we had a quite large bump to cross, even large for a Scorpio that it touched the foot base. Slowly, Rigzin negotiated it and we were almost like at the top, ogling at the great Himalayan peaks on the other side of the valley almost from the eye levels. We stopped there for a while but since, sun was rising from that end, could not capture it in the camera though we took lots of picture of ourselves. No one was behind us, no one was ahead of us, we were alone again… Soon we reached a beautiful Shyok Village, no words can describe the beauty and even the pictures below do not do any justice at all… A camper told us that few landslides were cleared last night and if we drive cautiously we will be able to pass through the route into Nubra Valley. It was a sigh of relief and we had full faith in Rigzin to get us through… There is a route that goes near Shyok village to Daulat Beig Oldie (DBO), a military base, which is the easternmost point of the Karakoram Range and about 9 KMs short of Aksai Chin Line of Actual Control between China and India. 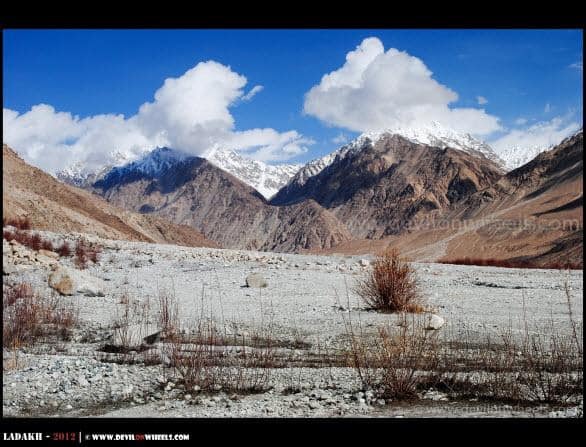 The temparatures goes below as low as –30 degree celcius here and also DBO is considered to be the Northernmost built up area in India after Siachen Glacier military bases. We continued and there came a point where I could not resist to stop amidst the rocks. It was super fun sitting there taking pictures and seeing the courage of Rigzin who kept us laughing wit his jokes. We were told by that villager there is a GREF hut from where we can inquire about the conditions ahead because there are lots of rocks present on this route right on the road. The Captain there said they had clared the road upto end last night itself, warned us to be cautious and go ahead… It was such a photogenic point that it looked as if a rock had been placed right there to take the pictures only. 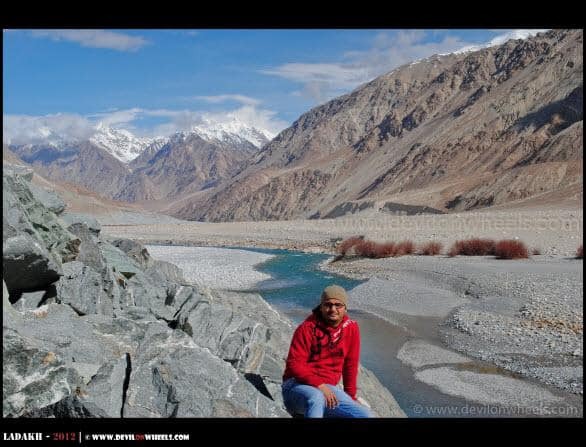 Good opportunity for Himanshu to get some nice matrimonial snaps 😉 … As we moved, ahead the road deteriorated badly, as if we were running on a river bed, it was indeed a river bed only. 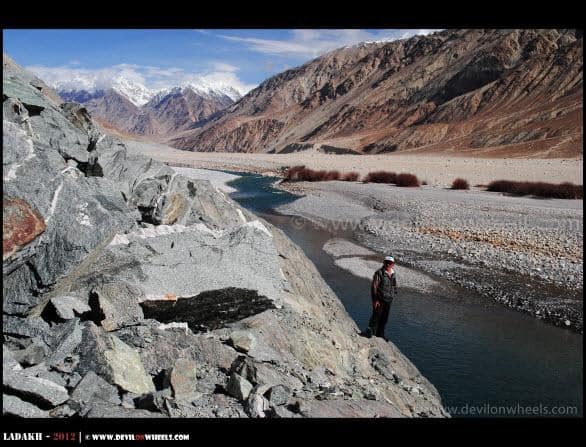 Extremely bad and dangerous, and yes the Shyok river was flowing right aside. At places we had to move out, clear the rocks in front, make our way and then move ahead. Finally, there was water all over the road, a part of river was flowing on the road itself 🙂 … This was the adventure, we never knew what lied ahead for us. We got out, check the level of water as Rigzin planned the exit path, I took the position to get some pictures out of it … We managed but guess it punctured the rear tyre. We kept moving ahead since there was still OK type air pressure in it. As we moved ahead, there was a very rough road full of sharp rocks, negotiating which Rigzin pushed the car on the dirt track and one wrong move, VOILA!! We were stuck in the sand!! 😀 … Badly!! It is in a situation like this when you feel how isolated the route was and if it had been more ugly then it meant trekking back miles to get some help… We were all alone on our own and the funny part was Rigzin had taken out the shovel from the car before the start of the trip only, which meant pulling out sand had to be done with hands only… The fun begins now of removing all the sands below the rear wheel by hand and gathering stones, placing them beneath the wheels and a hard push. The cars moves 1 feet ahead 😥 … It was about 12-15 feet from the road and first attempt had exhausted us but our Spirits were very high still… One more cycle of placing the jack, removing the sand beneath, placing the rocks, a hard push with throttle and we inch ahead a few more feet… Hats off to the stamina of Rigzin as we were only playing a supporting role and he did all the hard work and finally after 7th attempt, we were back on road, hugged each other with joy!! 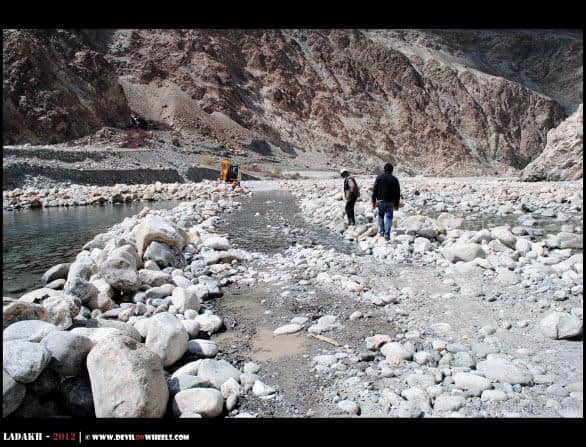 We took out some dry fruits, food whatever we had in our bags, offered first to Rigzin and the precious water as we stopped ahead aside of Shyok River… We got stuck majorly due to the low air pressure in the tier or perhaps we were unlucky enough. 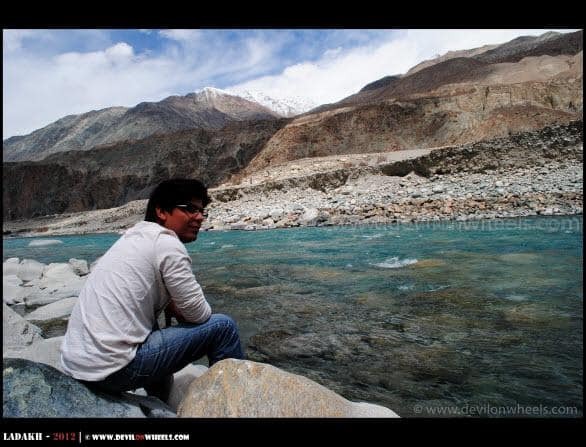 As we gathered back the breath sitting aside the river and gulping the ice cold water, I realized how serene and calm was the whole aura around us. It was a great feeling but we didn’t know that it was not over yet. As we moved ahead, there came an extremely bad section on the road with around a 200 feet fall on one side and active landslide on the other, as Rigzin jumped out of the car removed the rock in front and moved ahead a bit. Then, I jumped out of the car to provide guidance and let him concentrate on the road as rocks were falling from above (happened twice) and I was clearing in front. 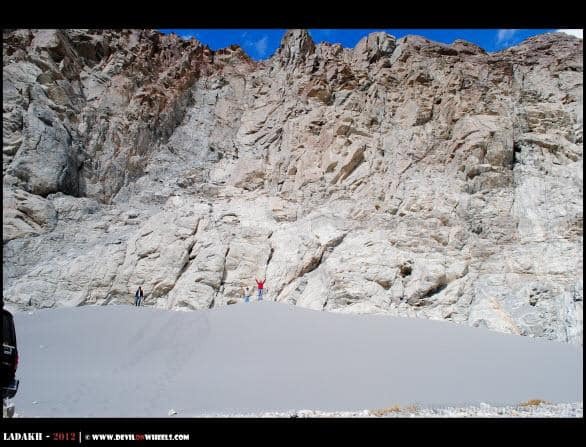 But, glad we got out in one single piece… It was tough and heart pumping moment. 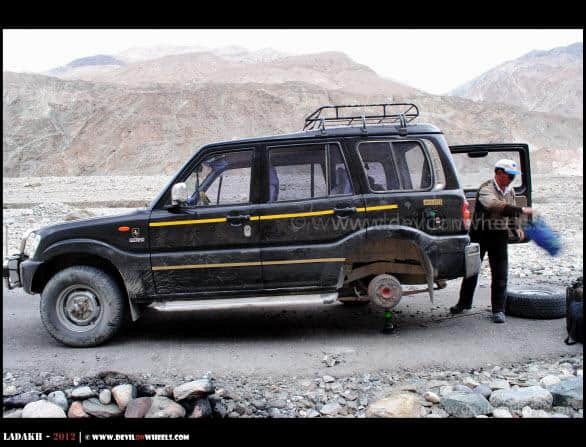 The hardest part was we could not accelrate as well because of loose big rocks beneath which did not let car to get the required grip. Thankfully, it was done and again we were laughing at ourselves, thinking was it worth the risk… Well, some questions do not have any answers in Adventure!!! We know whachu talking about! We took the same route but during off season. Siddhartha, thank you so very much brother for this timely update and whoaaa… what an adventurous ride. 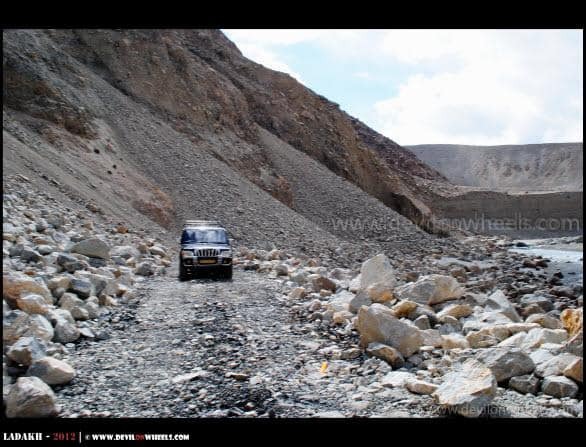 In that landslide zone, I was running ahead as there was stones coming down, clearing those stones so that our car moves. It was indeed scary that time but you know now how it feels…. Yes, the route is not something to be taken easily, that is why never recommend to people especially with family. When you are actually there it looks like a crazy decision. Also, if something goes wrong, you are into big trouble and on your own!! 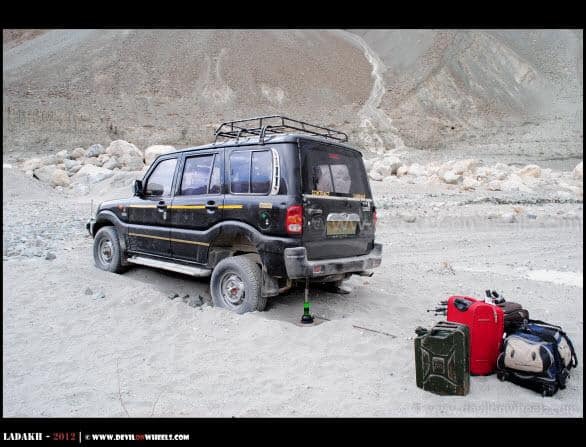 If possible, try and share your Himalayan Travel Tale or experience with us at DoW – Himalayan Travel Community. It will help many others find the information in structured way and would be more useful to all travellers. I m looking to explore the Pathankot-Basohli Bani Bhaderwah Anantnag Srinagar stretch. Any tips ? Sorry Atul, not been on that route. Was the river too deep in these two crossing. What about the ECU of the Classic 500…..a bit of water inside and they say that the electrical will malfunctions? Did you take out the ECU and then Manually pulled it in the crossing? Or was any modifications made ?? Btw I am trying to get through this route this June…. may be……your points will really help a lot. Just came back from Ladakh last week. Thanks a lot to DoW for providing all information required for this trip. 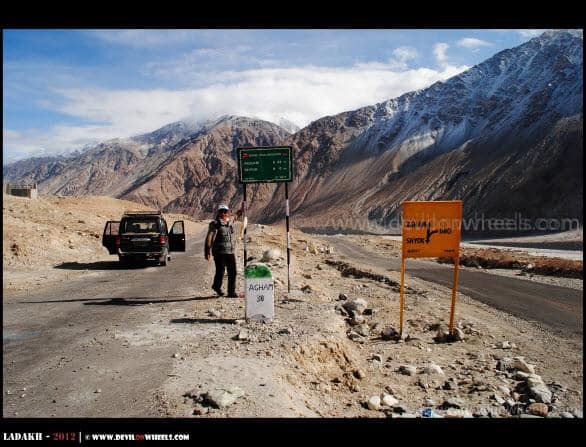 We took this route from Nubra to Pangong via Shyok as I did not want to cross Khardungla and Changla and spend n extra day. I got an excellent driver by name Karma Sonam( contact 9419215110, 9906991011) who is not only an expert driver but also a great travel companion, guide and a very good human being. 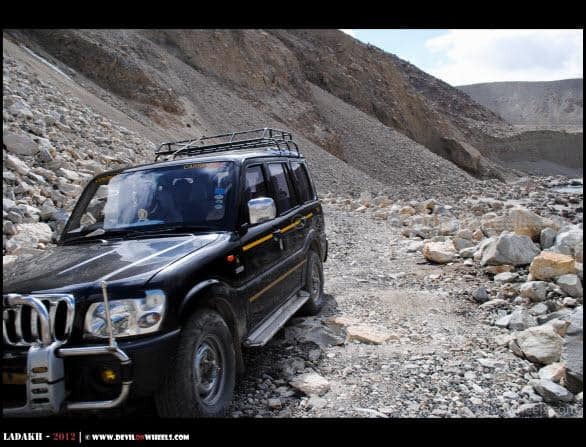 He has been quite familiar with the Shyok route and he agreed to take us through the route. We traveled on 24th May, 2015 and Karma confirmed that there will not be any water on the road. 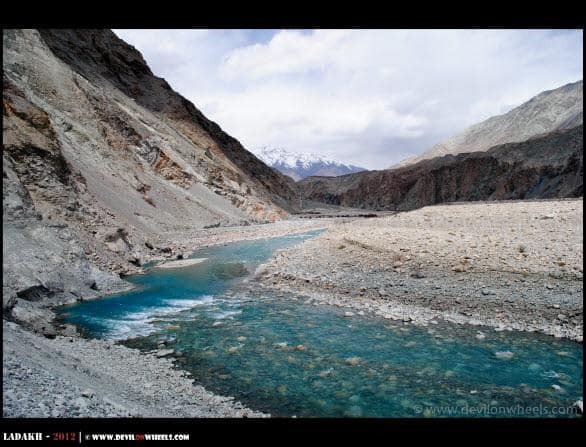 The route is one of the most scenic routes in Ladakh with beautiful blue Shyok river beside you for most of the journey. 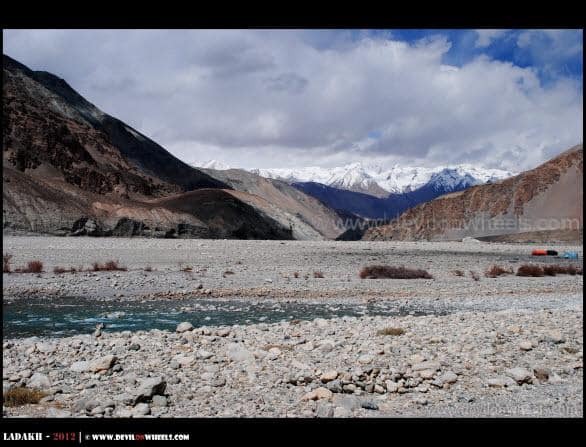 It is also a journey of a lifetime as you will be driving on the river bed in may places. As it seemed the road got destroyed in landslide in a few places (and there has not been any attempt to repair it for quite sometime). Karma has been quite familiar with the detour. 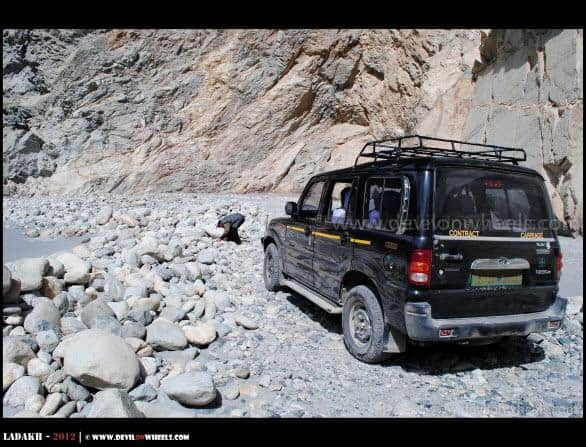 But remember we saw only one car in 4 hour ride to Durbuk. 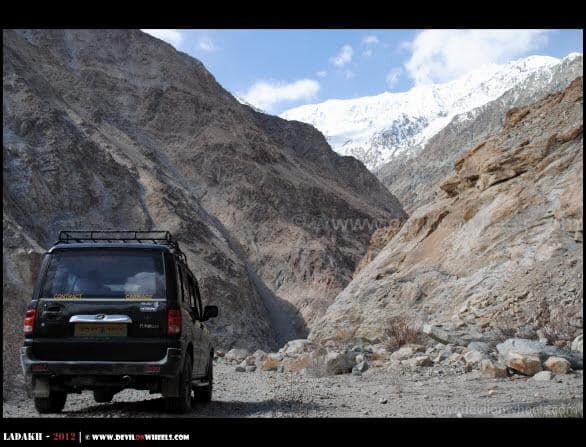 It is a journey worth taking if you are adventurous and travelling in summer and have a very confident driver like Karma. I actually traveled with my parents (80 and 70 year old), my sister, wife and son( 12 years old). 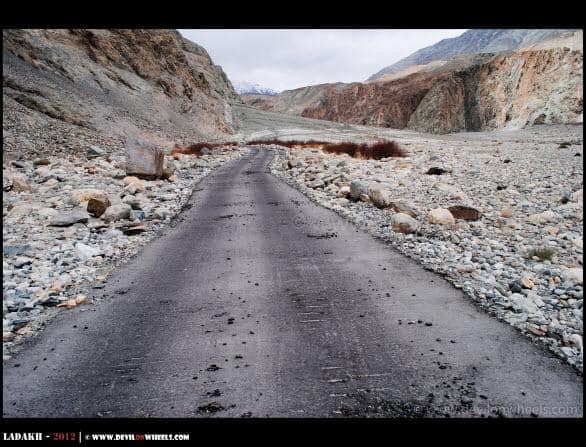 Thank you Partha for updating the road condition and highlighting the desolation of the route. 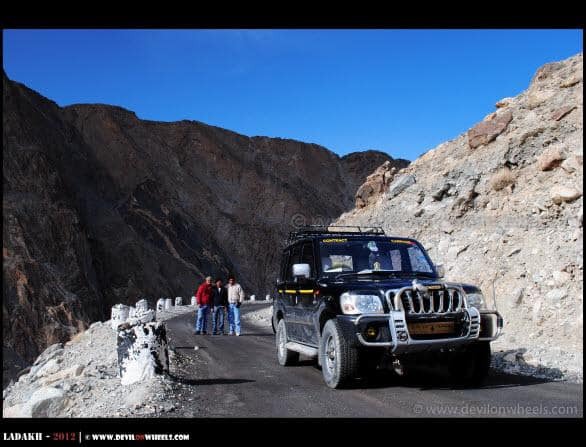 Glad you were able to do that route and yes, completely agree that it is one of the most scenic routes in Ladakh espcially around Shyok village. I have updated the driver list with your review. Thanks for the review. 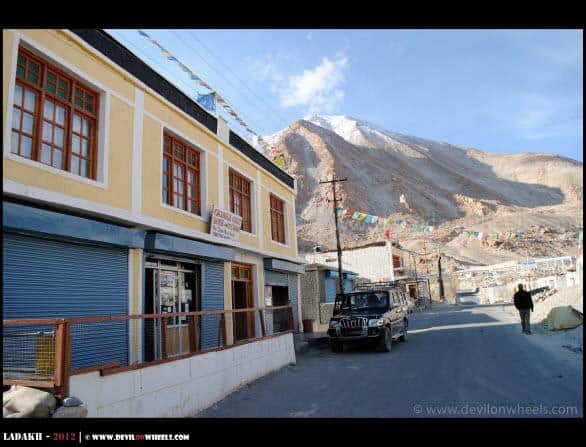 Can Karma help us in finding cheap accommodation in and around Leh? Do you have any idea about it? So Ankit, you think we should remove Karma from the list? He called me and was very apologetic about his lack of judgement to tag us with other untrustworthy drunk driver. We should downgrade him and should give home one more chance to prove himself.Thanks for your quick response. Good to know that,thanks for the update Ankit. Thanks for the update Vimal, well, you did it in time. The part of route has started being submerged now in the late hours of the day. Soon it will be submerged in Shyok river in few days for the season. awesome yaar . 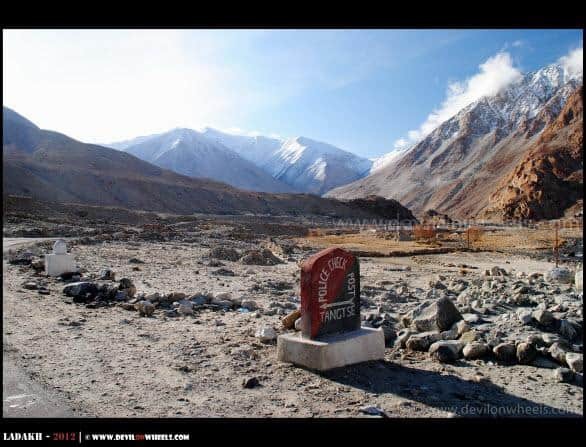 . . but how much time will it take from nubra valley to pangong via shyok village.. and we are plannig to take force traveller . . ! is that car capable of doing this ? not actually CAR its a MINI BUS ! 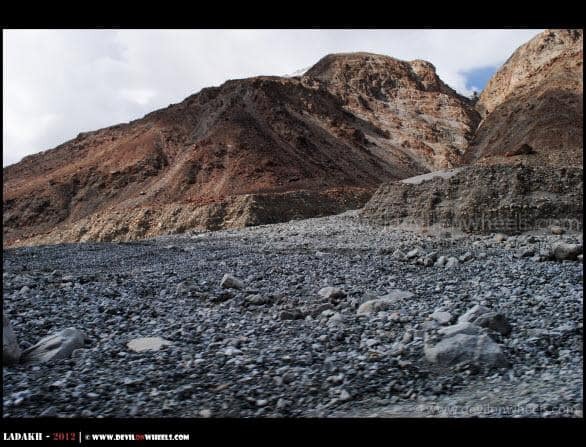 Ayaz, as you can see and might have read this is one of the most isolated places in Ladakh and even local taxi drivers fear to drive there. 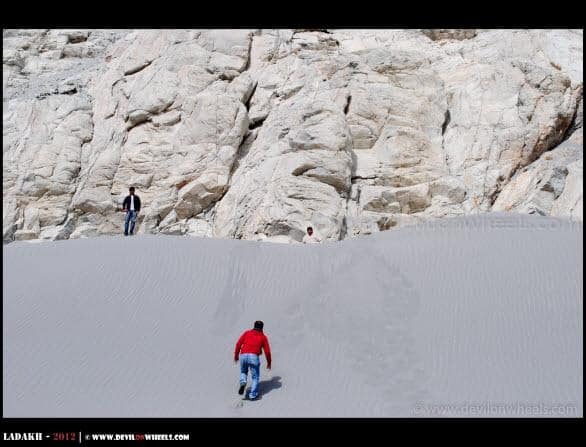 Time taken about a=be approaximately 6-7 Hrs from Nubra Valley to Pangong Tso via Shyok Village but if you are stuck then you are all alone in this terrain. 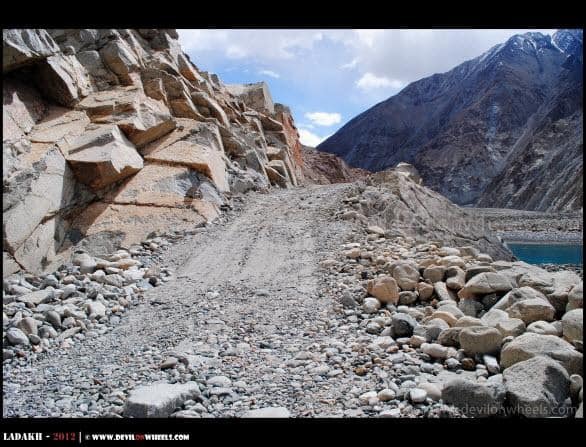 It also depend if the route is open or not because generally it closes every year due to landslides starting June. 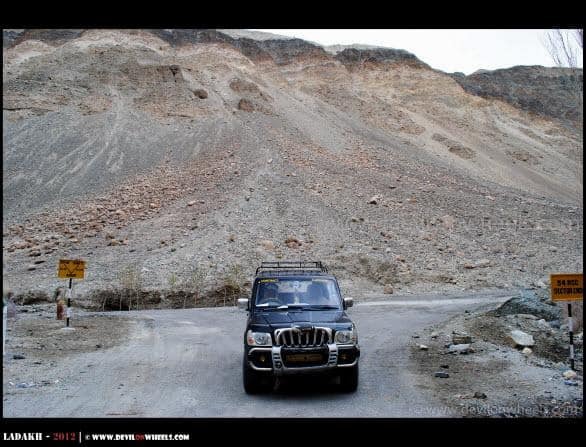 hi dheeraj…….you are very right as in starting june the road for approx 15 kms is terrible with 5 kms almost impossoble due to landslide and two river crossings……..but hats off to you that you managed to take some real good shots of the route……..
dheeraj bhai wt a fantastic adventure u hv …. BTW wt is the actual distence of bad patch??? between shyok and agham? Vikas, thanks alot. The distance of the bad patch is about 4 – 5 KMs and there are couple of such patches but mangeable. 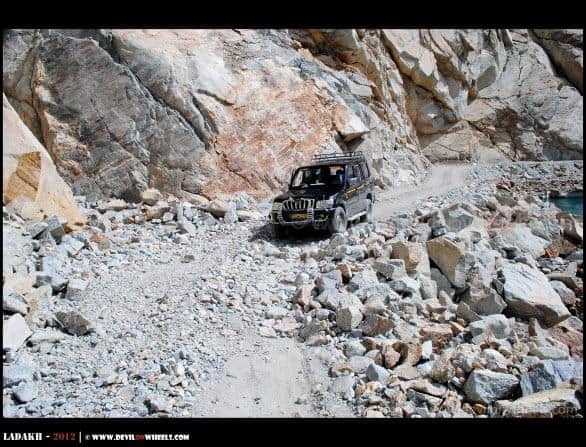 The scariest one is about 600 – 700 Mtrs or may be a KM only. Dheeraj – Quite an adventure! and some smashing images there! 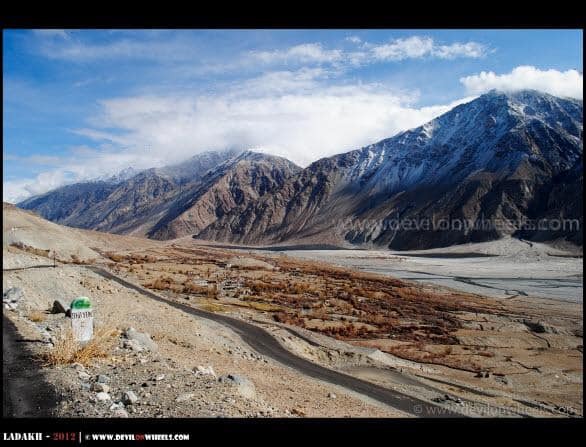 As a photography enthusiast, I was wondering how much of SD card memory would be good on a 5 day trip to Ladakh? I have 32 GB at my disposal right now, do you think that should take care of the trip if I were to go ballistic clicking pictures? and how about batteries? At Nubra – at the hotel/guest how will it be possible to re-charge O/N? Thanks alot SG. Yes, it was one of the great adventure of my entire Travel. 32 GB is more than enough sir,I had just 16 GB and came back with 12-13 about 2.5K pics of which discarded almost 50%. So, 5k in 5 days seems large number to take stats into account 😀 … Anyways, I feel should be enough. I used to carry two with me. 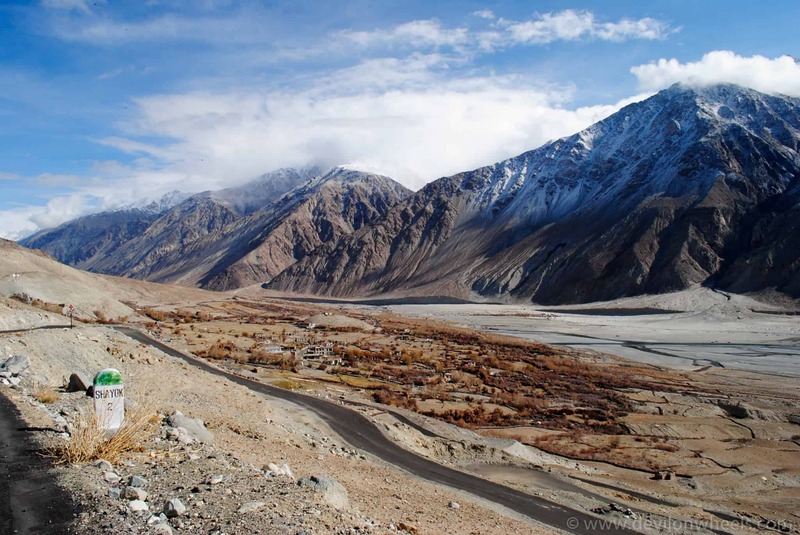 Most places do have electricity including Nubra Valley. Only at Pangong Tso, you will not get electricity else everywhere you are staying. Good lessons in how to use jacks to get your car out of the sand after it had sunk in! Do you need to mention Shayok specifically in the permit? How much time did it take from Shayok to Agham? Is any permanent improvement in the condition of the road expected or will it continue to be a Jun-driveable road? Thanks alot HVK sir. Nopes, we did not mention Shyok Village on the permits and neither we found any barricade or post which checked for the permits. It took about 5-5.5 Hrs from Tangste including an hour or so wasted in Tyre sunk issue and puncture. 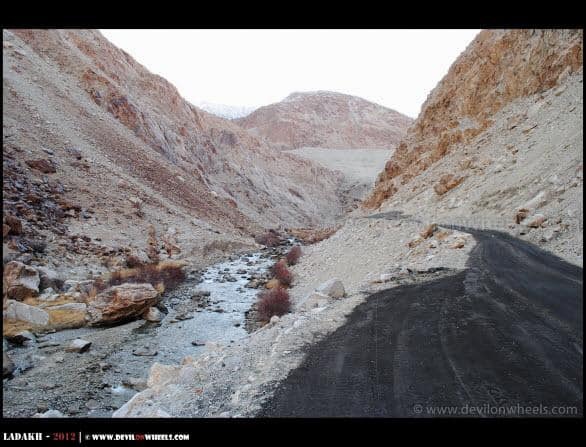 And, as far as what I saw there I cannot see Shyok village route be open in months of July and August when water crossing are ferocious due to rapid melting of snow as well as little more rain that Ladakh has started getting now. 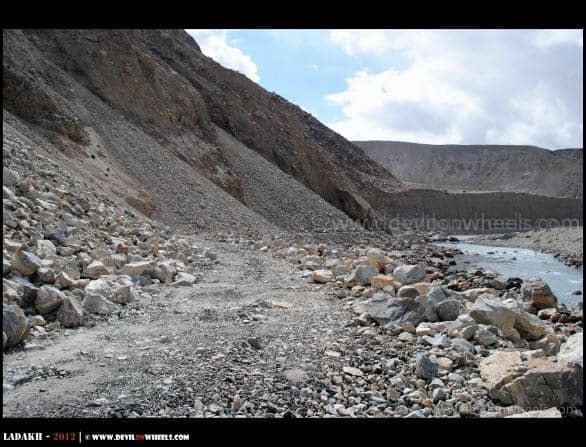 The whole new road cut through the mountain after 2010 flashfloods are almost on the river bed and if the water level rises in the Shyok river then definitely it is bound to be closed. Also, that continuous landsliding section is just too dangerous even in dry conditions and would be worse in wet conditions. So, most like it would remain as upto June drivable for sometime now though they had definite plans to keep it open through out the season. Wonderful photographs , for us to admire. 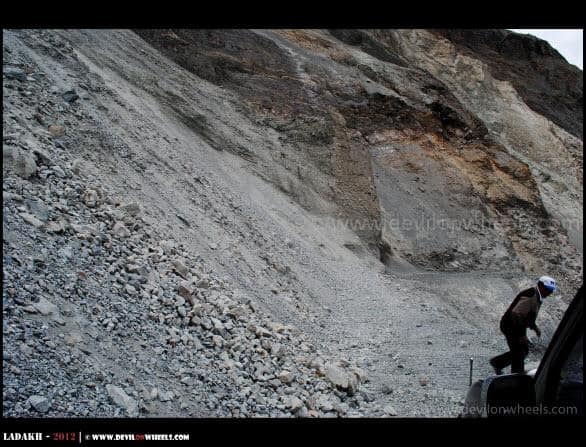 Awesome account of landslide road crossing. Adventure, yes, thank God everything went well. Hi dhreeraj. I am just glad reading your fabulous time,need little help about current road condition ok or not till udhampur Srinagar highways till Kargil?I am connecting from Delhi from 25th Aug 2012 on bikes. 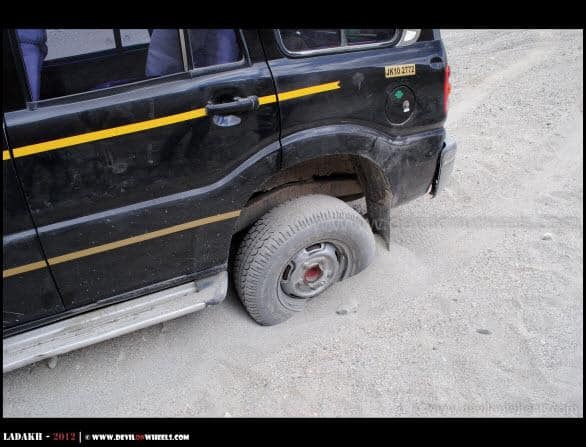 Yesterday itself, I got a call from one couple who were driving through Srinagar – Kargil and they reported that things are OK to drive though roads are not that good and especially when they inquired about Manali – Leh Highway, the slush conditions between Marhi and Rohtang Pass is pretty bad. They did not face much issues over Zozi La but yes, definitely some rough sections. Shyok has really fantastic colors man and u captured best of its color! I m confused now after reading this one can’t dare to go there alone but picts are really pushing me to visit that route! 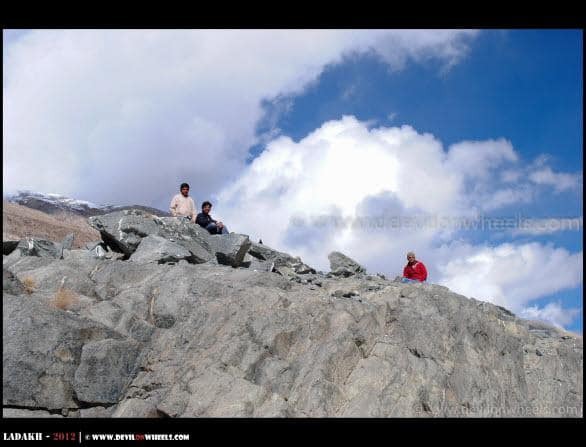 We are booked from Srinagar – Leh by Xylo next week. Looking at the flood situation, how safe is it to go there? 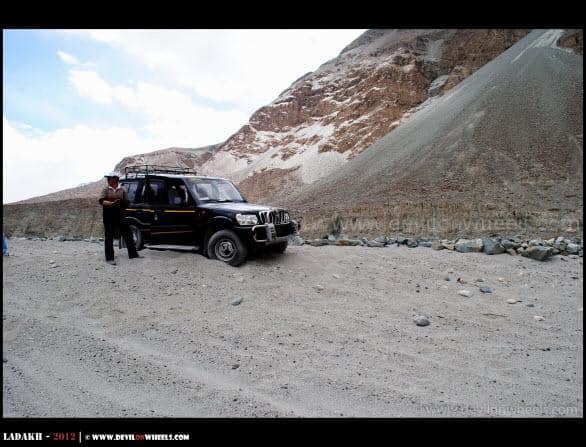 We leave srinagar on 12th aug and reach Leh on 13th stopping at Kargil on the way. How slippery will the roads be? we are a group of 5 family members ages ranging form 17-50. 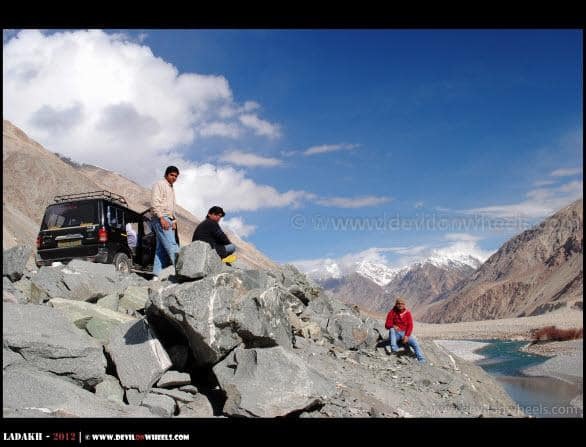 We reach back to srinagar by the same route after a week in Leh, taking in Nubra and pangong. Should I go ahead with this trip this time or choose some other alternative, looking at the floods there currently? Generally, for normal landslides, hats off to BRO + GREF guys they clear these roads within a day or two to resume traffic. So, go mentally prepared, if going and have few buffer days for sure. India at its best….No one can imagine that these kind of places are in India…..what a place…..
वाह भाई, फ़ोटो के साथ विवरण ने समां बांध दिया है। GREAT DETAIL.